I've recently been enjoying reading the old reports on the website, especially the early stories and photos from years ago. Thought I would mention an old one. Peggy and Paul will remember from the early days, when my brother and I started kite fishing, while we were living in Auckland 15 years ago. Paul was working from home then, and we used to arrive at their house in Glen Eden and watch as our kite and gear was being assembled on the lounge floor. Often we would talk to Paul over a coffee and he would advise us on all the principles on baiting, setting the gear, etc. which I still use today. Back in those days my brother and I had a fantastic day kitefishing from Rimmer Road, Muriwai Beach. We caught so many fish we had a struggle carrying them all back to the car. Included in this particular catch was my only 20 plus pounder caught in Auckland. (photo left). The fishing here at Mokau has been incredible. I discovered a new spot within 5 minutes drive from Mokau and all I've been catching is snapper, most of them big ones. Every set I'm usually getting one fish of 6kg or just under, and half a dozen good schoolies. I caught 5 around that size in the last 10 days and on Thursday night, March 27, I nailed another over 20 lbs, it was 9.2kg and it topped our local competition for the month, but only held out for 2 days as a boatie caught a big 11.6kg snapper. Bugger! The wind is now southwest so I can't fish. Tony Johnson, another local, has landed some good catches as well, with 2 fish of 6 to 7kg. Visitors have had mixed success, but I've noticed a lot don't go out far enough. I don't catch fish if my line isn't out at least 1000 metres. I don't know if the kitefishing club has records, or whatever, but since moving to Mokau I have caught 13 snapper over the magic 20lb mark kitefishing. I've had 2 monsters on that bent my old hooks out straight that would have gone 30lb I reckon. This is my goal, to land the monster snapper. Photo and Article Courtesy of the Dargaville and Districts News, April 9. "Pensioners in the Baylys Beach area have been eating fresh fish thanks to the fishing fortunes of local, Billy Glover, who landed this 52.8 pound (24kg) kingfish last week. It was caught on a kite line launched right in front of Chases Gorge and the catch included a modest sized snapper and a kahawai. About two years ago Mr. Glover made the news with a massive 28 pound (12.7kg) snapper." 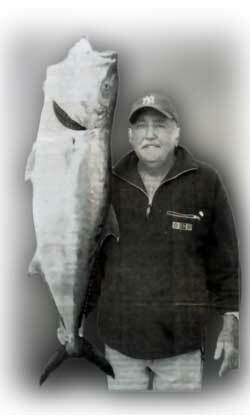 Ed: Billy Glover has been successfully kitefishing the west coast of the North Island for many years now. I gave him a call to congratulate him on his fantastic catch and to find out a few more details. According to Billy the catch was taken on either April 1st or 2nd. He was using a bottom longline rig baited with salted mullet and powered by a Nighthawk kite. The winds were southerly and the surf conditions made setting the gear in the normal manner near impossible. Using the running shot method, Mr. Glover set his longline rig from the back of his wagon while driving slowly up the beach. lain had an excellent days fishing at Muriwai recently. Iain was fishing a dropper rig at the South Head of the Kaipara on April 10 and using a combination of mullet and squid baits. Mr. Macdonald caught a total of 20 snapper, 14 of which he took home, and a couple of good sized kahawai. Bodo reports he has mastered his 65kg dropper rig and manages to catch fish in even the lightest of winds while other kitefishers struggle. Fishing near the Golf Road entrance at Muriwai Beach on April 13, Bodo ran 3 sets with only 5 hooks per set. The first set returned 2 nice snapper, the second with 2 large gurnard and the third with 1 huge kahawai. Photos are currently still in the camera but, according to Bodo, as soon as the film is used up we will have the pics. April 14 presented ideal conditions for boaties on the west coast. The sea was glass calm in the morning. Robbie and 3 other keen fishers headed out from Tinopai and anchored up next to the green marker in the Kaipara channel within view of the top end of Muriwai Beach. The fishing was red hot! From rods baited up with salted mullet, the 4 fishers wound up with their bag limit of snapper within the first 40 minutes of fishing. 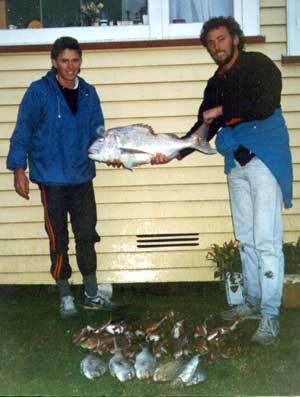 According to Robbie, most of the snapper were school size and the biggest 9 of them were all around 2kg. All were using keeper hooks on their rigs and catching quite a few under sized, gut hooked snapper. Robbie cut off his keeper hook to reduce the chances of catching more under sized. Robbie reported there were no Target Hooks on the boat and as the trip was a last minute decision, he'd completely forgotten to take some. On April 14 we decided to head out and do some kitefishing at Muriwai Beach. It was 10.30am, high tide had been at around 9:00am. If we left immediately we could be on the beach by around noon. It would be perfect for driving up the beach. Incredibly we couldn't find a flexiwing kite or skyhook at home and we didn't have time to pick one up from the shop. Paul found a couple of early prototypes of the flexiwing that had been rejected for one reason or another and we decided to take a chance that we could get one or both flying. The winds were south easterly and, due to the fantastic reports we had from Robbie about the Kaipara, we were going to head straight up to near the top end of the beach. Being a Monday, and with the winds almost blowing straight up the beach, there were very few kitefishers on the beach. By the time we got to around 5 kilometers past the Rimmer Road access, just before the cliffs, we decided to stop and give it a go. Both the kites we had were early flexiwings and neither was very stable in the 35-45 knots of wind we had on the day. The kites had different spar positions and keel and eyelet positions and one of them also had bigger spars than our production kites. One of the kites flew OK downwind when a shopping bag was connected to the bridle but because of less than optimum geometry was unstable when tacked. We did not have a skyhook. We used this kite on Paul's 9/0 Penn reel spooled with 50lb dacron and opted to do a running shot with no tack. We loaded up the rig with the full compliment of 12 traces, a combination of normal Target Hook traces and several double floating bead traces. With the kite launched, a 2 litre bottle half full of sand in place on the dropper line, one 8oz weight on the front of the hook section and a few smaller weights distributed among the hook section plus 12 traces with large baits we proceeded to set the gear. The gear hit the water at a good setting speed but with the winds blowing a mere 10 degrees offshore at best and a fierce rip and ugly dumping surf running in the same direction, it wasn't going to be easy. With no one else in sight on the beach it was an ideal situation for a running shot. We got back in the 4WD wagon, stuck the rod out the window and drove slowly up the beach. In an effort to negate the rip, we kept abreast of the setting kite as we let the line run out. Usually this works great for unloading the strain from the kite and allowing it to gain more angle off the beach and in turn set the gear further offshore in tricky conditions. For some reason this set was the exception to this rule, it stopped dead at 400 metres out. After a short time we decided to pull the gear back in, reduce the number of hooks we were setting, and have another go. The reason for the gear not heading out was soon discovered. A large bronze whaler shark, obviously caught very early in the piece, had made up it's mind it wasn't about to be dragged back out to sea. Close behind the shark were two snapper of 1 and 2kg. With only 5 hooks on the next set we tried again. This time Paul walked the gear up the beach for the running shot and while we did manage to get the full line off the reel, the gear was set at only around 45 degrees off the beach. The tide was about to turn, time was running short and with no stationary fishing time at all we hauled the gear back in with no fish. As we drove off back down the beach feeling pretty dejected we stopped to chat with a few other kitefishers to find out how they got on. We wound up feeling much better with ourselves and our catch as apparently we were the only ones to manage to get the gear out and catch any fish. Even without a skyhook, by taking a little extra time setting the kite up for the conditions and doing the running shot, it paid off. PS: We are both sure that if we had had any of our production kites like a Super Kite, a Nighthawk or Flexiwing that could be tacked, instead of the rejected designs we took, and had taken a skyhook, we could have set out dead square from the beach on any dropper rig and caught plenty. The fish were in really close, 300 to 400 metres out, just beyond the break. Another good day on 7th April with six nice snapper and one trevally, though all NOT on the large side. Tasty none the less. Down side is I lost my kite (broken kite line), so please keep an eye open for an 8ft blue patterned, and black Delta wing. It was one of those times where down low the wind was light, but higher up blowing really well. Fishing into the evening it was a great day. On a side issue, Bruce Thomson's comments regarding the West Coast "Management" Proposal of F&B deserve total support. I have submitted my own rejection of the proposal but fear that, as I am an ordinary 5th generation "kiwi of mixed ethnic descent", my views and RIGHTS will be over looked in favour of the minority interests of a few. As New Zealanders, we have RIGHTS also!!!! Looking forward to a trip to Muriwai on the weekend. After reading Bruce Thompson's tirade against the Marine Park proposal, I downloaded the proposal and had a read through. I wonder if he read the same proposal as I did, because I saw no mention of "closure of this whole stretch of coast". It seemed to me that recreational activities would be virtually unaffected except for the five small areas within the marine park designated as marine reserves. I have seen first hand both the incredible increase in marine life populations and the popularity of these reserves with visitors. I have no doubt whatsoever that they provide new recreational opportunities while improving the quality of activities outside their borders. Given how small an area marine reserves occupy, the decision to make more of them seems a no-brainer to me. I fully encourage readers to read the proposal for themselves and make their own informed decision as to what impacts (positive or negative) the proposed marine park would have. Ed: I think the West Coast Marine Park is one of the greatest threats to Auckland kitefishers continued access to the coast, and I completely reject the scant and questionable evidence that a spillover effect improves fishing outside marine reserves. I speak from the experience of having commercially fished out of Leigh, which is very near the Goat Island Marine Reserve, for three years. Fishstocks of interest to recreational fishers on the west coast are highly mobile species which will not stay in the reserve or park. Snapper, trevally, gurnard, kahawai, kingfish, mullet, flounder, dogfish and sharks of all types will continue their seasonal migrations inshore and offshore and up and down the coast as they have done for thousands of years. The commercial sector will still be able to catch their quota of all these species outside the reserve or park, so what is the point of having one for mobile stocks of finfish? All of these species are managed sustainably under the Quota Management System and if a fishery is in decline or needs rebuilding then we should use the Quota Management System to set sustainable limits while rebuilding the fishery. There is also no evidence that vehicles driving up and down the beach between high and low water cause adverse effects so why limit visitors as proposed. The proposed marine reserve at the top of Muriwai will prevent kitefishers accessing the top of the beach, the only place you can kitefish during southwesterly or southerly winds. As far as I know there are very few real issues on the west coast. I agree that there are some areas of localised intertidal depletion of shellfish at places like Piha Beach, concerns about hectors (maui) dolphins, and areas where rare birds breed. Management should be focused on finding answers to these real issues and not on attacking the rights of the public to harvest seafood sustainably. If anyone thinks this isn't the thin end of a very big wedge look at the broken promises of limited recreational fishing around the Poor Knights Islands. First, they got the reserve through by allowing limited recreational fishing in some areas, then went on to renege and ban all fishing in extensive areas. I DON'T TRUST THEM !!!!! !